Set to rise at the northern corner of Fifth Avenue and West 43rd Street, 520 Fifth Avenue is likely to be the first skyscraper along Fifth Avenue to top the 900-foot mark. The project will rise in the heart of Midtown, one street away from the eastern end of Bryant Park. The glass-enclosed tower will have 76 floors and stand 920 feet to its pinnacle. Handel Architects is the architect, and Arthur Hooper of Ceruzzi Properties will be developing in conjunction with SMI USA. 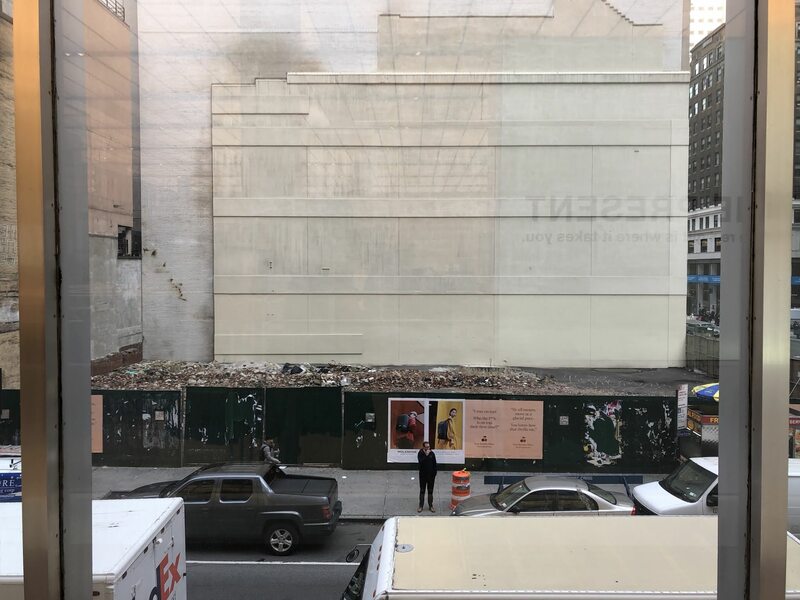 While work has not yet kicked off at 520 Fifth Avenue, things appear more promising for this site than the others already profiled by YIMBY involving China-backed developers. In this case, that is SMI USA. The Real Deal reported late last month that Madison Equities might be brought into the $500 million dollar project. Ceruzzi has been looking for additional development partners since purchasing the Midtown in 2015 for $275 million from Thor Equities. As seen in photos from YIMBY’s recent visit, excavation work has remained on hold after machinery appeared on-site back in 2017. The lot held flea markets for a time several years ago, but the latest news regarding Madison Equities’ involvement is hopefully a sign they will not return. 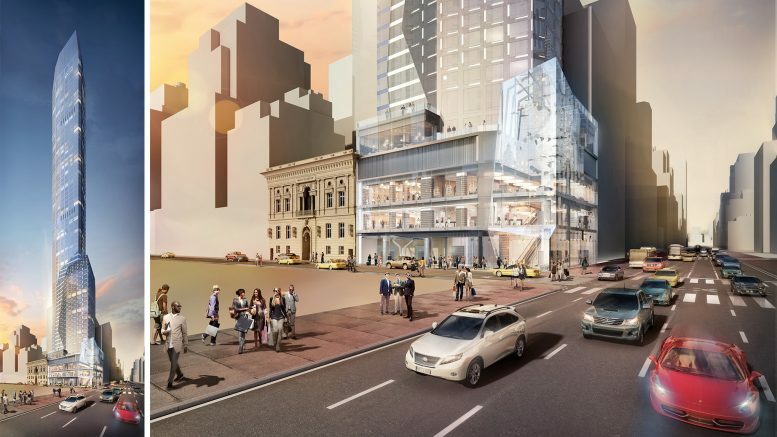 Renderings of the project show a three-story retail section at the base, with large floor-to-ceiling glass walls facing Fifth Avenue and West 43rd Street. The building’s podium takes up the entire lot before yielding to a tapering tower enclosed in a glass facade. Residents and hotel guests will enter the building from West 43rd Street. Inside, there will be around 171,000 square feet of residential living space, with 145 units measuring around 1,300 square feet apiece. There will also be a hotel spanning 21 floors, with 208 rooms spread among 175,000 square feet. The retail base is planned to cover about 35,900 square feet. While the design has changed several times in the past, the rendering seen on the green construction fence today matches the above, and shows the top of the tower designed with a multiple-sloped roofline and chamfered corners. A completion date for 520 Fifth Avenue has not yet been confirmed. But with Madison Equities’ hopeful involvement, the site may be one of the few high-profile projects not yet off the ground in Manhattan to soon get underway. 16 Comments on "Checking In On Ceruzzi Properties’ Planned 76-Story Skyscraper at 520 Fifth Avenue, in Midtown Manhattan"
What happened to the 42nd Street Library? Who needs books anyway, good spot for a super tall. Indeed my friend. Who needs parks as well? Bryant Park would be ideal for a super-super tall. I believe the new tower will be on the northwest corner of 43rd and Fifth, NOT the southwest corner of 42nd and Fifth. C’mon, do you really think the library will be demolished??!! First on Fifth to top 900 feet? I recall once hearing about something called the Empire State Building, at 350 Fifth. Maybe it was a dream…. The Empire State rises along Fifth Avenue? In your dreams my friend. They simply liked the more trendy 5th Ave address better than bland 34th Street, that’a all. Yes, the Empire State Building is indeed located on Fifth Avenue (350 Fifth). So, for 88 years it was – still is – the tallest building on Fifth Avenue, and most likely will remain so for decades to come. This space has been empty for a long time. Also-how does a tower “grow up on the ground”? Not everyone has your perfect command of the language. As for this vapid ‘real-estate-y’ obsession with quantifying everything, especially building height, it reminds of the notorious toad-Hollywood Studio Head from the 1930’s who was correctly assessed as: “a man who knew the price of everything and the value of nothing”. As for this little number contemplated for the corner of 43rd: the rendering is so impenetrably “eyewash-y” , contrasting vividly rendered people, cars and the abutting palazzo with this vague, gauzy proposed aglomeration of amorphous forms that it’s impossible to properly understand whether good, bad or banal. If ultimately done right and pushed away from the Ghery-induced expressionistic drug-trip track and toward a quieter, more composed demeanor this might possibly evolve into an interesting building, as it suggests (only begins to suggest) some concern for the handling of program and the response to context. Now, if a good measure of the show-off vulgarity can be duly filtered out! I feel this land should be sold to new team, a more suitable developer. Why is it only 920 ft? The Library HAS and Very Likely will ALWAYS have the MOST Stories On 5th Avenue. Wow, and woe are we, this is a very unfortunate proposition for 5th Avenue. This ‘budget beanstalk’ seems bereft of both a big idea, and deep pockets. The rendering would seem to show a building which has fallen victim to value engineering at conception; could that be reason for the wholesale cribbing of stock references from the latest generation of manhattan towers? The mangled nod to its neighbor to the south, SOM’s manufactures Hanover building doesn’t do anything to make this a better fit on the street. At least the Century Association benefited by selling its air rights, but won’t we will suffer a bit having this thing around? WHERE’S THE SUNSHINE? Most of manhattan will be in perpetual shadow when these looney builders are finished destroying the city , Their voracious greed has done so much damage so far and they continue to build Where’s the city infrastructure and mass transportation .It’s hard to walk the streets as it is now, there’s just no room ,yet they build more and more extra tall buildings on streets that were laid out for horse and carriage.